Id software has finally brought their classic FPS franchise Wolfenstein to current-gen consoles. Back when Wolfenstein 3D was released, it presented cutting-edge technology and helped expose a lot of gamers to the world of 3D shooters. Now 10 years later, can Wolfenstein inspire a whole new generation of gamers, or has time passed this franchise by? The story takes place during WWII and starts the narrative on a Nazi ship where sailors are looking for a spy on board. Enter your character BJ Blazkowicz, the series veteran who single-handedly shut down Hitler’s Übersoldat program and thwarted the resurrection of ancient superhuman, King Heinrich I. He has been sent to stop a missile attack, and while onboard he finds a medallion that carries some sort of mythical power. The allies’ scientists discover that the medallion is the Thule Medallion, and it is used to control the Black Sun. They conclude that to get more answers, BJ needs to go to Isenstadt to find out what the Nazis are up to, as well as help out the local resistance. BJ also discovers a second medallion, and learns that when used he can enter something called the Veil. The Veil allows BJ to see a darker realm where creatures are flying around and secret doors are visible, that otherwise can’t be seen with normal vision. 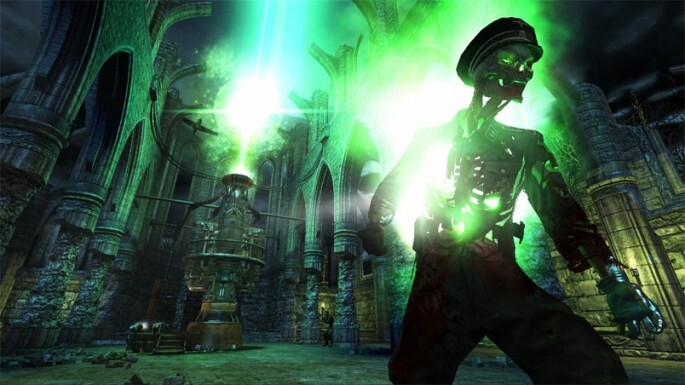 The Veil also posses quite a few benefits, such as illuminating your enemies to make them easier targets. BJ can also move quicker with the Veil throughout the game. As BJ discovers more crystals he unlocks more abilities like the ability to slow time or conjure up a shield. The gameplay in Wolfenstein is pretty standard for an FPS, and though it doesn’t bring anything new to the table, it does it fairly well. The shooting mechanics are well incorporated, and the ability to have the Veil powers spiced up the action. Although the missions themselves were quite linear, how you receive your missions isn’t. Isenstadt is BJ’s main base of operations, and is essentially an open world. You can travel freely throughout the streets and most buildings, as well as the sewers and rooftops. Within Isenstadt, there is also a black market where you can purchase upgrades for weapons, as well as veil powers.